Nazarbayev University Graduate School of Public Policy (GSPP) is holding the next research seminar of the 2018- 2019 academic year. Date and time: January 30 (Wednesday) at 12:00 pm. 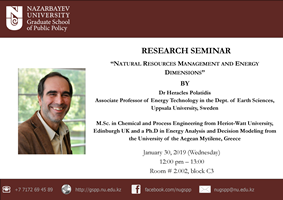 Speaker: Dr Heracles Polatidis, Associate Professor of Energy Technology in the Dept. of Earth Sciences, Uppsala University, Sweden. Topic: Natural Resources Management and Energy Dimensions.